Of all human bodily functions, defecation has been described as perhaps the least studied and the least understood. Elimination doesn’t just remove wastes from the body, but may play a vital role in hormonal, cholesterol, and bile acid regulation. Some have even advocated for bowel habits to be considered a vital sign, right alongside pulse rate and blood pressure. I review the latest science in five new videos, including How Many Bowel Movements Should You Have Every Day? and Should You Sit, Squat, or Lean During a Bowel Movement? They are available right now as a video download as part of my new Latest in Clinical Nutrition volume 25 (all proceeds go to this charity). It can also be ordered as a physical DVD. The bowel movement videos are all scheduled to go up on NutritionFacts.org next month, but you can download and watch them right now. The current batch of videos from volume 24 on NutritionFacts.org just ran out, so running until August I’ll be rolling out the videos from this new DVD, volume 25. The DVDs give folks the opportunity to sneak-preview videos months ahead of time, watch them all straight through, and share them as gifts, but there is nothing on the DVDs that won’t eventually end up free online at NutritionFacts.org. If you’d like the works–40+ hours of video–you can get the complete DVD collection. 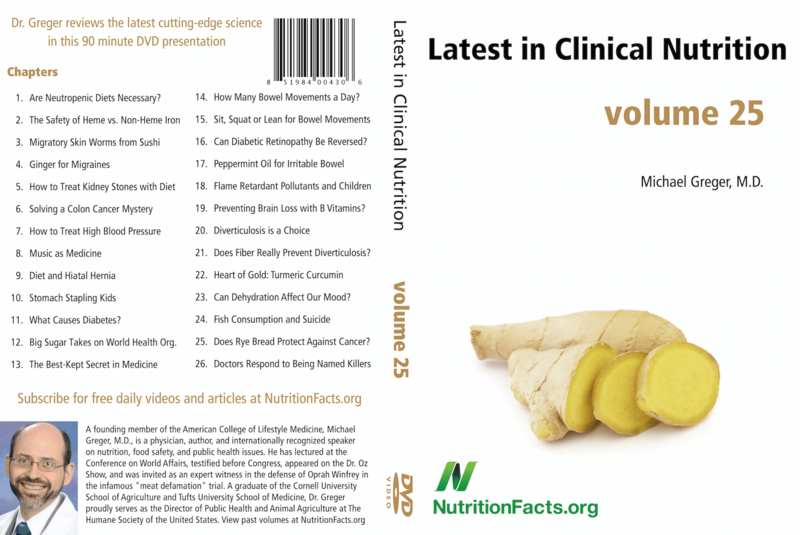 In the image above you can see the list of chapters from the new volume 25 DVD — a preview of what’s to come over the next few months on NutritionFacts.org. Order my new DVD at DrGreger.org/dvds or through Amazon. It can also be ordered as a video download at DrGreger.org/downloads. If you were a regular supporter, you’d already be a bowel movement expert by now, having already received the new DVD. I now come out with new DVDs every 9 weeks. If you’d like to automatically receive them before they’re even available to the public, please consider becoming a monthly donor. Anyone signing up on the donation page to become a $15 monthly contributor will receive the next three DVDs for free (as physical DVDs, downloads, or both–your choice), and anyone signing up as a $25 monthly contributor will get a whole year’s worth of new DVDs. If you’re already signed up and didn’t receive your volume 25 yet, please email Tommasina@NutritionFacts.org and she’ll make everything all better. If you’d rather just watch all the videos online here as they launch, but would still like to support my work of helping to educate millions about healthy eating, you can make a tax-deductible donation to my 501c3 nonprofit organization NutritionFacts.org using a credit card, a direct PayPal link, or by sending a check to “NutritionFacts.org” PO Box 11400, Takoma Park, MD 20913. Although there are already some great sites out there for free healthy recipes (like ForksOverKnives.com, StraightUpFood.com, and HappyHealthyLongLife.com), I’d love to feature some fan favorites on our Facebook and Google+ pages. Once we accumulate enough we can compile all the links onto a NutritionFacts.org recipe page to make it easier for everyone to put healthful eating into practice. Just like the best drugs in the world don’t work unless you take them, the healthiest foods in the world don’t work unless you eat them. It’s my job to give you the best science as to the healthiest foods to eat; it’s your job to make them delicious. So get cooking! Submit links to your favorite recipes to recipes@nutritionfacts.org. 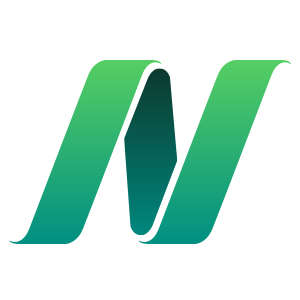 I’m excited to share that NutritionFacts.org pages are now getting nearly 20 million hits a year, an average of more than 50,000 views a day. I’m so honored that so many find my work useful and worthy of sharing. Though even with 62 active volunteers (we love you!) and four dedicated full-time staff working overtime, you can imagine how overwhelmed we would be if even 1% of viewers contacted us. And indeed we field hundreds of requests daily. Our current average response time is 47 hours, and as the traffic continues to grow, we’re afraid of falling even further behind. So we’ve created a Help Center to help solve common technical issues (in addition to our FAQ). We will continue to respond personally to any and all inquiries; this is just an additional resource to make your NutritionFacts.org experience as smooth and effortless as possible. Speaking of smooth and effortless, I hope you enjoy my new bowel health videos! Michael Greger, M.D. FACLM, is a physician, New York Times bestselling author, and internationally recognized professional speaker on a number of important public health issues. Dr. Greger has lectured at the Conference on World Affairs, the National Institutes of Health, and the International Bird Flu Summit, testified before Congress, appeared on The Dr. Oz Show and The Colbert Report, and was invited as an expert witness in defense of Oprah Winfrey at the infamous "meat defamation" trial. I don’t know if it’s been there before or not, but I noticed the section that said something like, “Learn About Dr. Greger” for the first time with this video. It’s an excellent piece! Both in terms of being a great addition to the DVD, but also I liked the content and how it was put together. Good job. And great job with the DVD topics themselves. The videos have matured so nicely. I really like how so many of the videos give us lots of background information and plenty of studies to back up each topic/claim. Hello, I just bought a digital version of a video but….where do I find it? I thought it was going to be sent to my email. Anybody knows please? Thanx. Subscribe for free and receive a free copy of Dr. Greger's Evidence-Based Eating Guide!